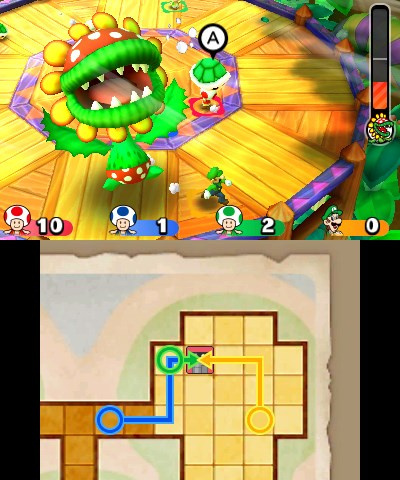 Perhaps indicative of its stature in the grand scheme of things, Mario Party: Star Rush was initially revealed by a throwaway line in a press release at the end of E3 2016's first day. A series more readily associated with home consoles, Star Rush is the second entry in the IP to arrive on 3DS. That may suggest it's a quick cash-in sequel, but it actually feels rather like a test for the more free-wheeling and competitive aspects of the series that have been somewhat lost in recent times, even if the usual last chance bonuses ensure that no-one's ever truly out of the game. The key change in Star Rush, across all of its varied modes, is that you're no longer sharing a vehicle or moves with your rivals; that alone will likely get fist pumps from followers of the series. There's now freedom and strategy in independent movement, while a common approach across the modes is that players are constantly participating. Dice rolls and movement happen for everyone at the same time, so there's no more waiting around twiddling thumbs. Right from the off, then, it's evident that consistent complaints from fans have been heeded. Before we get into a breakdown of the modes, there's another key feature that is worth highlighting. 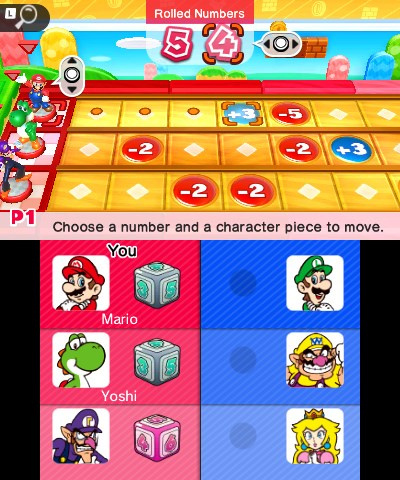 While all modes can be played solo and against CPU opponents, Nintendo has acted to ensure that the portable aspect of the release doesn't necessarily hinder local multiplayer, which is vital for any Mario Party game. A 'Guest' download will be free on the eShop and is essentially the whole game minus the vast bulk of single player content. As long as one player owns a full copy and hosts a room, three other 3DS owners can jump in with the free Guest download and have immediate access to the multiplayer experience in that session. This is a key feature - and deceptively simple in its implementation - and it minimises a common issue with portable Mario Party games: namely that it's less intuitive to play with others, which is the most fun way to experience these games. While it doesn't replace the shared madness of TV play, nudging and smack-talking friends that are on their own 3DS is still a lot of fun. Performance is flawless using the Guest downloads too, with no lag in our tests, even to the point that the music between units was perfectly synchronised. Oddly there's still a Download Play option, which will have the usual load times and limitations, but the Guest download ensures that families or groups of friends with four 2DS / 3DS units handy will only need one copy of the game to get stuck into the multiplayer modes. 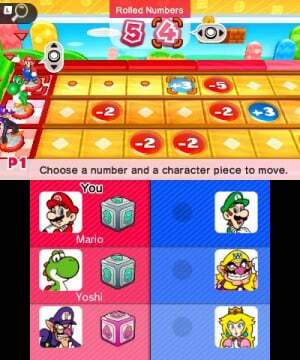 Mario Party lives or dies by its modes and minigames, of course, and overall the mix is a decent one. There are some enjoyable highlights, some decent alternatives and one or two outright duds; overall the positive inclusions outweigh the weak points. Let's break them down. 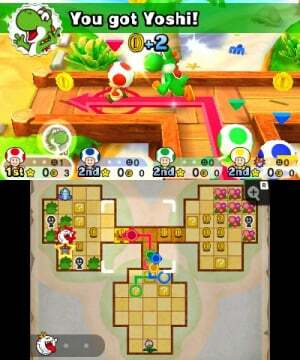 The most publicised mode is Toad Scramble, though thankfully it's the only one with a limited cast. It's an interesting setup, as you gradually unlock a range of diverse maps which require a bit of strategic movement in addition to the usual minigame mastery. Starting off with your Toad, the key objectives (beyond the usual item blocks and distractions) are to grab AI allies as they appear (in the form of other members of the cast) and make it first to Boss encounters. It's in coming out on top in the Boss minigames that the Stars - the key currency for victory - are won, so having a few allies helping you out not only adds to the zany action but boosts your chances in a big way. We rather like this mode, especially in later maps where the environments get trickier to navigate. When playing solo you can even scan in a compatible amiibo right off the bat, giving you an extra character in your team and a special item. Don't feel guilty about using this, either, as setting CPU opponents to 'Very Hard' (with 'Normal' and 'Hard' being other options) actually throws up a tough challenge. We're not convinced the 'Luigi doing nothing' meme will work in this one. 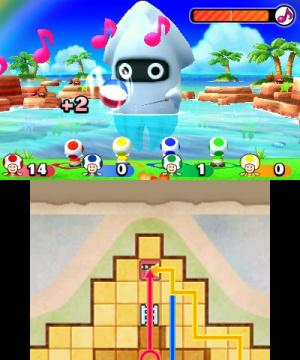 Toad Scramble is fun, in the end, and that's fortunate as it's the first mode unlocked. Your copy of the game essentially has a profile and 'Party Level', with activities and successes building up XP to level up. A number of modes and characters are unlocked this way, but it's nothing to fret over - we found that unlocks came along relatively quickly, so it won't be long before you've accessed all of the content on offer. Next up is Coinathlon, which is our favourite mode for dip-in solo play. Each round has you racing around a simple board by collecting lots of coins across three minigames. This mode has its own batch of coin-centric games, and though the 'campaign' necessitates clearing a lot of rounds you can save progress and return any time. A typical round, depending on the number of laps, should last between 3-8 minutes, ideal for quick portable play. Though you'll get overfamiliar with the limited number of minigames in this mode, they're some of the stronger examples in the game and the heat of the battle is rather addictive. Dishing out and being on the receiving end of disruptive items adds to the tension, and in some rounds there are even Bowser interventions (an idea partially borrowed from Mario Party 10) where the participants scramble for survival. This mode is certainly a standout, especially for short single player sessions. Balloon Bash returns to more standard Mario Party fare, and is also the best mode for playing the broadest variety of minigames. A few different boards are available and the formula's simple - pop balloons, win coins, fight it out in minigames and try to trade those coins for Stars. 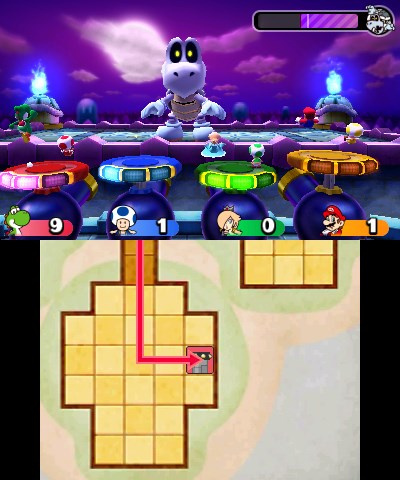 Though the maps are small, encouraging players to crossover and occasionally have brief 'duels' on the same square, this feels closest to Mario Party of old, albeit with that benefit of everyone rolling the dice and moving at the same time. As already mentioned, this is a great way to experience (and unlock) the broadest range of minigames. In multiplayer we found that longer sessions (of 20 or 30 turns) dragged on a little, but you can easily switch to a 10 turn round if you wish. It's a toss-up between this and Toad Scramble in terms of the best multiplayer mode in the game, though those that want quicker minigame action will likely lean towards Balloon Bash. Next we have a bit of a dud in Rhythm Recital. The idea is that you play through iconic Super Mario tracks as part of a mini orchestra with other players. The arrangements are peculiar, however, as your parts don't reflect the core track but add misplaced extra lines. It's a simple tap-based rhythm minigame, but aside from the pleasure of listening to the tracks this one falls flat. If the player's actions better reflected and contributed to the music we'd be more generous about this mode, but as it stands it feels like a throwaway and sloppy inclusion. Mario Shuffle, similarly, feels like an odd misstep. Two teams of three characters aim to move across to the rival's side in a straight line, taking advantage of or avoiding squares that have basic effects (+ and - moves, basically). It's a simple dice throwing game, primarily driven by luck with a smidgen of tactics also involved. You can scan an amiibo in for a little advantage, but overall this seems like a poorly thought-out mode, lacking creativity and spark. It's possibly the weakest inclusion in the game. Boo's Block Party, thankfully, brings us back to more positive territory. Essentially a 1 vs. 1 match-3 game, the twist is that you're trying to match numbers on blocks. These blocks are numbered from one to four, so you need to rapidly rotate them to complete matches and stop columns piling up to the top of the screen. It's a simple idea, but these sorts of games are popular for a reason - ideal for quick, intense matches. Finally we have Challenge Tower, which is effectively a vertical Minesweeper. You climb one level at a time, and blocks you land on light up in different ways to indicate that all surrounding blocks are clear, or to indicate one, two or three surrounding blocks are dangerous and can halt your progress. A bit of brainpower is needed, and you can 'mark' blocks you deduce are actually traps. There are a few difficulty settings, and this offers a welcome change of pace along with a simple mental workout. Beyond that there's a Minigames area where you can pick or randomly play a mix of the games you've unlocked and accessed so far. The minigames are split into distinct types, reflecting how they split up between the different modes, and our overall opinion is that it's a solid if unexceptional batch. Most are skill-based, with occasional luck-driven examples, and there's plenty of charm along with a mix of physical button and stylus-based challenges. These certainly aren't the best that Nintendo's produced, but the overall collection of minigames is generally effective and enjoyable. All told that's a decent amount of content, and a couple of duds are easily overlooked in favour of the meaty main modes and a couple of enjoyable shorter games. We've found enjoyment in Coinathlon and occasionally longer modes when playing solo, but the big selling point is to be found in local multiplayer. We've happily lost some time at home and on a car journey when playing with others, which for this 30-something has been a strange blast from the past. As you'd expect, too, it's a game designed to make you smile. Cute animations, light-hearted music and surprisingly clean visuals - combined with a nice use of the 3D effect - help this one to entertain and charm in equal measure. Mario Party: Star Rush achieves its goals. It's entertaining, charming and offers some easy-going minigame fun. The main modes have a nice variety and sense of purpose, and aside from two duds the overall offering includes a mix of longer-form and quickfire gameplay options. The free 'Guest' download is a brilliant touch for quick and easy local multiplayer with only one full copy on hand, and even though the minigame collection isn't Nintendo's finest we've enjoyed some light-hearted - and occasionally feisty - games with family and friends. 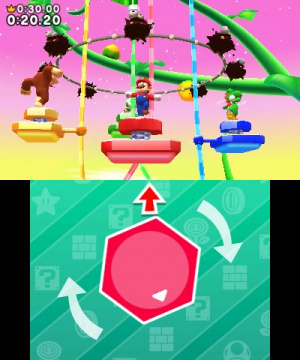 Mario Party: Star Rush may not excel in many ways, but it addresses some complaints from past entries and delivers some harmless entertainment. 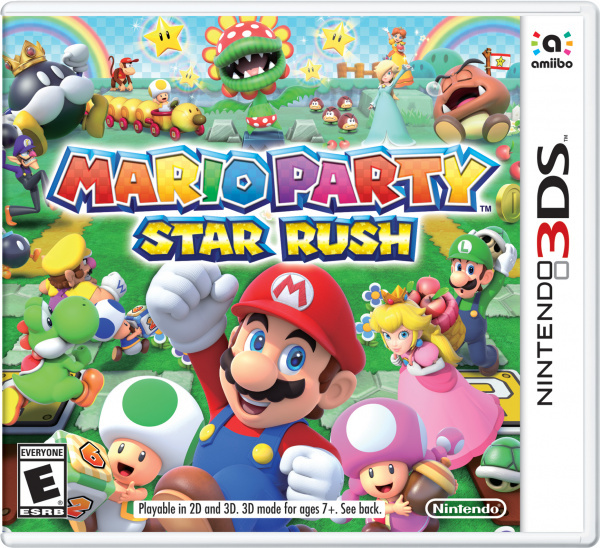 We're not sure you should rush out to buy it, but it still shows that Mario and company can be stars of a party. Might actually pick this up, sounds like the first MP in quite a while that's actually pretty good. Sounds an 8 to me to play with the kids. I'll eventually pick this up before the end of the year. Nice! I'm one of the few that really enjoyed Island Tour so I'm pretty hype about this. Too much coming out in October and knowing my pals probably won't wanna play this with me, I'll skip this one for now. Maybe for Christmas, though. That multiplayer download sounds great, as someone who's never bought a Mario Party before I might be keeping my eyes on this. Will get it sometime, probally next year. I'll get it sooner or later! This review got me interested. The only Mario Party that ever interested me was MP10 for Wii U. Man, I'm longing for that next Mario Party that captivated me like 1-3 did. And this ain't nostalgia talking - we still play them to this day! Although to be fair, Mario Party 10 proved to be a decent game for us as time went on. It has its quirks, but still fails to deliver an overall experience akin to what the series used to be so famous for. @SM4SHshorts It would be fun if they start fresh and call the game Wario Party. Wario smashing the car from MP10 and creating his own party game, but a little bit darker then the first MP games. @pinoswine Competitive WarioWare. I could get behind that. I'll get that next month. Sounds pretty good based on the review. I might get this. I love the SNES era style character icons! I prefer that style for Yoshi, and it's great to see other characters in that style too. Darn. I was hoping you'd post the Color Splash review first. What an unecessary game. We've had 3 Mario Parties in the last 3 years! This should have been released instead of Island Tour. Probably not a day one buy for me. I am considering getting it sometime next year. I think they've got their timing for this all wrong... this is the sort of game that would be great for long car trips, like you'd do over the summer... over the winter you'd be getting together with friends and family at home more... so a home console release would be better at this time of year. That said, I'd really like to see a home console release (possibly NX) that incorporates these new changes and additions... more recent games have failed to impress, but this seems to improve upon them greatly. Looks pretty good... But why doesn't it come out till November here? Personally, I would like a giant "best of" collection of the past 13 Mario Party games (we do not mention Advanced) and then just end the franchise at that. I was interested, but lack of online just kills it for me. Mario Party is the kind of game that is good for all ages, and at my age, online is essential. Probably pick this one up around Christmas. YESH! I've actually been really, really hyped for this game, so I'm really happy to see it get a good score. I'm sure it won't be another Mario Party 2 or 3, but it still looks really fun and would be a good way to mix things up. I'm going to take off work and buy this the day it comes out. Hopefully my friends and I will be able to spend some of the weekend playing this! Aaaand now I return to my break from the internet... Hopefully I won't be gone much longer, just need to finish up some important stuff... Or the NX will be announced... Whichever comes first. Will give this one a pass as I have given all current mp games. "Mario Party: Star Rush may not excel in many ways, but it addresses some complaints from past entries and delivers some harmless entertainment. 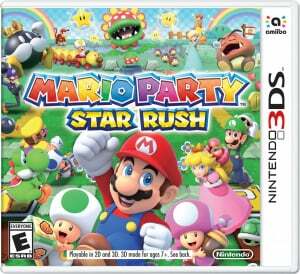 We're not sure you should rush out to buy it, but it still shows that Mario and company can be stars of a party." Well, Star Rush doesn't have you and friends sitting in a vehicle, nor playing the plethora of boards with badly executed rules that rely truly on luck. Toad Scramble seems to be a more strategic version of the classic formula, Coinathalon relies more on skill and looks fun, and Balloon Bash is the closest to the classic MP formula we'll ever get and it also looks fun. That Boo mode looks fun, so...nothing wrong there. That Rhythm Recital mode looks intriguing. Mario Shuffle...okay, I'll admit, I've seen footages of this mode and it does look rather awkward, especially compared to the far superior amiibo Party mode from 10. Not interested in Challenge Tower, so...pass. As for the minigames, they do look more fun than what Island Tour and 10 offered, so...that's something. I dunno about you, Whitehead, but to me Star Rush does excel in many ways, at least compared to ND Cube's previous MP entries, and because of that I am willing to go rush out to the stores and buy it when it is available (I'm an American, so November's pretty much the spot). 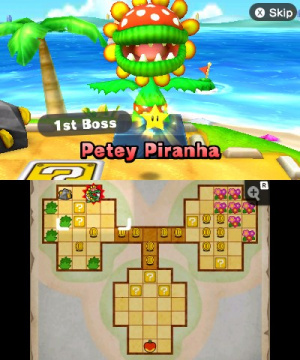 It may not GOTY in the 3DS category, but it's definitely a massive improvement over the "amazing" Island Tour. Man, I love Mario Party games as much as the next guy, but Island Tour was a putrid disaster for me. Download Play makes it a definite purchase from me. World Tour was such a great game, but I couldn't play the dlc courses with anyone so it quickly lost all of its appeal. And we had a blast with Mario Party DS. I was hesitant about this game but maybe this could be the MP fix I need. I mean it's been close to a decade since the last good MP game (MP8). It's really hard to convey to people that 7 is a pretty good score. Inflated scores don't help and ruin expectations. People were praising the Last of Us because the story was exceptional, and thus gave the game a 95, but many many people I talked to couldn't even get past the first few hours. I tried twice until I finally decided that the story was the most important aspect, so I reduced the difficulty and basically played it for its story, but even on easy was still such a frustrating slog of a mess gameplay wise. The story was well done and its a beautiful game, but there's no way that those aspects should out weigh gameplay, it is after all, a game. Sounds very promising! Looking forward to this! I'm glad the amiibos enhance the gameplay, and don't keep parts of the game locked. And it's always nice to see Petey again! Still hoping for a sequel to Sunshine! @StephenYap3 As I gave it 7 I saw it as a chance to riff (clumsily, admittedly) on the Star Rush name I don't think this is the home run that the series deserves, but as I said in the review I think it's a good effort and does a lot of things well. The best thing is the Guest download, in my opinion, which helps setup multiplayer off one copy. It helps to compensate for the fact that, ultimately, games like this are best played on a TV. And yes, 7 is a good score. Il'l put this on the list. There was never an instance where the car mechanic was implemented in the handheld games, so I wouldn't say the issue has been 'addressed'. It'll most likely be back in Mario Party 11, a console game. Guess I know what my family is going to be doing this weekend. @ThomasBW84 I don't think this game is the standard the series should be heading towards in either; I mean, as much as I want the original MP formula back, I'd like some new ideas to go with it as well. Not to say that I disliked the old formula, but I kind of want new ideas to make it fresh with each and every new installment that utilizes it. The Guest Download Version is definitely an awesome idea, though, and I like it a lot. And yes, I know 7 is a good score. 6/10 is when I start to worry a bit and 5/10...well, that's a coin flip for me. I got to know something! I own one New 3DS system, can I therefore scan an amiibo for each system or do I need to buy the accessory? @Bengyman Crikey, that was fast, and I was evidently wrong about that part of the difficulty! Gotta say this game is fun. Toad Scramble adds an element of cutthroat playing to the mix that is only akin to monopoly (which always ends up a flipped over board in my house). Just took this game on a weekend trip to a cabin. It ended up being the game we played most. Mario Shuffle was more of a highlight than expected. There's just something so rewarding with getting your three characters to the other side first. Also, Balloon Bash, Toad Scramble, and Coinathlon are a blast! I've been playing the Mario Party games since they came out, with number 3 being my favorite. The last couple games have not been fun (I'm looking at you 9 & 10), but this one is a very solid entry. 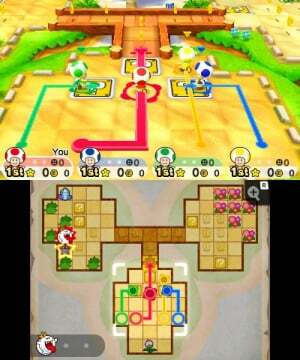 I can see my fiance and I playing this as much as Mario Kart 7. Good job, Nintendo!! This game is a winner! I guess I will have to read another review then.